Before you can export data, you must first setup the Export format. This is a one time action that you will need to do. The format must be setup exactly as shown in this section for the application to understand the format. Once you’ve logged into the Navica system, select the Resources option from the Menu on the left of the screen, then select the “Custom Exports” option as you see above. Once you select the ‘Custom Export’, the ‘Existing Custom Export’ screen will be displayed. Select the New Export button, to create a new Custom Export. Once you press the New Export button, the “Export Setting Step(1)” is displayed. Select “Residential” and then press the Next Step button. When you press this button, you will see the “Export Setting Step(2)” screen as shown below. In Step(2), you will select fields from the “Available Fields” section and move them over to the “Current Selected Fields” section. To pick the fields, select a field from the left table (shown as “Residential Fields” and press the Double Arrow key. You will see the item move to the table on the right. Do this for each of the options as shown in the graphic above. Note: Be sure that you create the ‘Current Selected Fields’ table as shown below. Once you have set up the “Selected Fields” section, press the Next Step button to go to the “Export Settings Step(3)”. Step(3) is used to finalize your export settings. Place the name “Focus1st” as the “Name” as shown above. Select “Yes” for the “Include Header Row” option and select “Tab” for the “Column Delimiter” option. Once you’ve provided the Name and selected the options above press the Complete button. You are now ready to do your MLS search and export your results. Make sure that all the status options are selected and select the starting ‘Sold Date” (note the staring date of 01/01/2008 assumes the current year is 2010). This option will make sure that all the data that is needed to create the appropriate graphs, is collected. You should also make your normal selection choice by selecting other options that you would normally select in doing a CMA. As mentioned earlier, looking at activity in specific subdivisions is a good starting point. Once you’ve selected the search criteria, press the Search button to see the results as shown below. Now you are ready to download the results. To download the results, select the drop down items from the option area. Then select the “Export All” option as shown above. Then press the Go button. When you select the Go button, the “Existing Custom Export” dialog shown below is displayed. Select the “Focus1st” option by clicking on the “Focus1st” work (it is a link). Next you will see the download screen shown below. 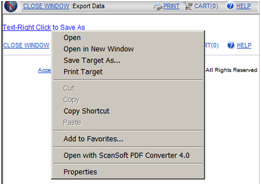 Click on the Text-Right Click to Save As and select the “Save Target As” option. The file “Save As” dialog box will be shown to allow you to save the file. Choose a file name and location. Be sure to remember where you save your file. This is the exported file that will be used to create your graphs. Once you have saved your exported file, you are ready to run the Focus 1st application. When you run the application you will need to point to the exported data file, so make sure that you’ve placed the file in an easy to find place. For instructions on how to run the Visual Pricing System, please see the tutorials located on www.focus1st.com.